Describe the process you went through while selecting your graduate or professional school pathway: what impacted your decision? I applied to different graduate schools based on their location and what the focus of their program is. I was more interested in clinical nutrition so I chose a graduate school that focused on this. My interview at the University of Pittsburgh is what impacted my decision the most because I felt from the interview that the professors and directors of the program would take an interest in me and my education, similar to the way that professors at Denison did. I also fell in love with the city of Pittsburgh when I traveled there for my interview. What challenges did you face on the way to graduate or professional school, and how did you overcome them? Learning about the journey and steps that were necessary to become a dietitian. There are many different pathways and options to become a dietitian but overall you need to have the required coursework and an accredited internship to be a registered dietitian. I ended up choosing a coordinated masters program which means that the necessary schoolwork and the accredited internship are combined into one program that you apply for. I didn’t realize what exactly I wanted to do post-grad until the end of my junior year. Figuring out all of the different things I needed to do to apply to the graduate school that was right for me senior year was a bit overwhelming but definitely worth it. What are your professional plans post-graduation? This is an interesting question for me right now and one I have been asking myself quite a bit. I am currently working towards applying for medical school while in this nutrition graduate program but I am still trying to figure out my exact timeline. I have a strong passion for nutrition and I know that my ultimate goal is to be able to apply my nutrition education to be a practicing physician one day. What advice would you give a current Denison student considering a graduate or professional program like yours? Don’t ever think that you need to know exactly what you want to do with your life today, tomorrow, or even next year. Follow what you feel passionate about at the moment and try to get the most out of anything that you end up doing, while also realizing you can change your mind at any time. Nutrition and Dietetics is an incredibly important field and there are so many different opportunities and directions that registered dietitians can apply their knowledge. I think it is a great field to go into! Own It. 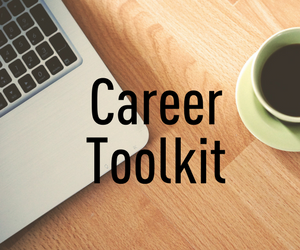 Career Planning doesn’t have to be daunting. From resume building to applying skills in the real world, the Knowlton Center will help you dive right in (and cheer you on as you succeed)! © 2019. All rights reserved. The views and opinions expressed through this blog are those of individual authors and do not necessarily represent the policies of Denison University.